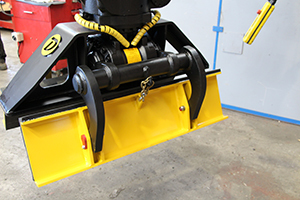 Using field proven construction equipment componentry Doherty have developed a range of specialised grabs which provide an unprecedented range of movement and control to lift and accurately position a wide range of materials from drainage pipes to steel beams. By incorporating the latest quick coupler technology and modern electronic control systems a Doherty Grab can quickly transform an excavator or wheel loader into an effective, efficient and very safe manipulator. Designed specifically for the safe handling of structural steel beams. The fully enclosed clamping unit provides and constant clamping speed and force – something that is impossible on a normal cylinder operated grapple – but is essential to permit precise positioning without damage or compromising safety. All GBB grabs feature soft replaceable gripper pads which provide superior grapping power without damaging the steel surface coating. The GBB140 shown below is designed to operate with a tilt rotator coupler which has two auxillary circuits. This allows the grab to rotate continuously while at the same time tilting 40 degrees left or right. 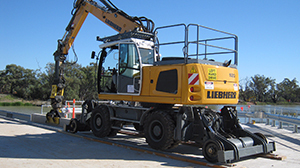 In addition the full crowd range of the excavator is available to provide fore and aft tilt. 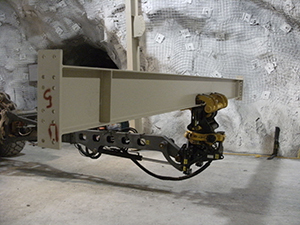 This grab and its unique mounting was designed specifically for the placement of heavy steel beams in an underground mining operation. 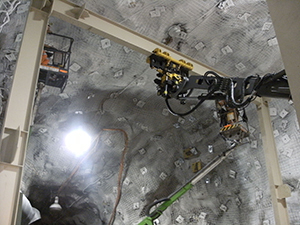 Because of the tunnel limitations, all beams had to placed from underneath as no slinging from a crane was possible. Using a fully proportional electro hydraulic control system to operate the grab functions, this Doherty design safely positioned all vertical, horizontal and diagonal beams to a +/- 5mm accuracy in record time and was awarded a Queensland Innovation in Safety Award. Here is another example of a custom built Doherty Grab. This unit is designed for the removal and replacement of “stop logs” which are used to control water levels in many Australian reservoir systems. Featuring and parallel swing side shift, as well as full tilt and rotate capability this unit is designed to operate underwater. 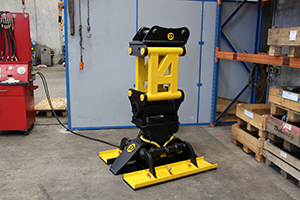 The specially designed clamping pads can be quickly reconfigured to enable the grab to position bridge beams as well as the concrete stop logs. 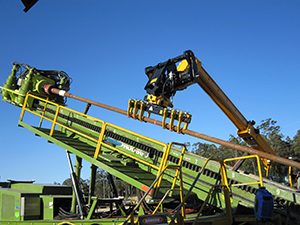 A wide range of pipe grabs can be combined with the unique Doherty Tilt/Rotate positioner. We can offer compact drainage pipe grabs for use in narrow trenches or multi clamp units which can handle a wide variety of diameters. 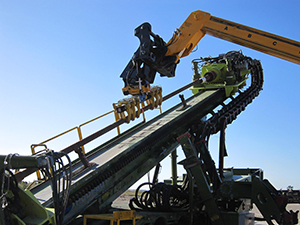 Pipe grabs can be provided with a precision controlled side shift and alignment arm to ensure the joining process is effective quick and safe. 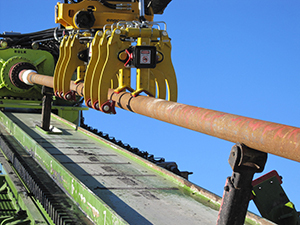 This pipe grab is designed specifically for use with a heavy duty telehandler. 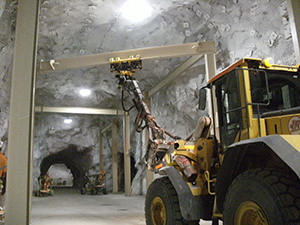 It is used to preload drill rods in a large directional borer. The roads can weigh up to one tonne and must be accurately positioned up to 15mm above the ground.